Taking good care of your asphalt parking lot or blacktop driveway is easy to overlook, but it’s an expensive mistake to make. 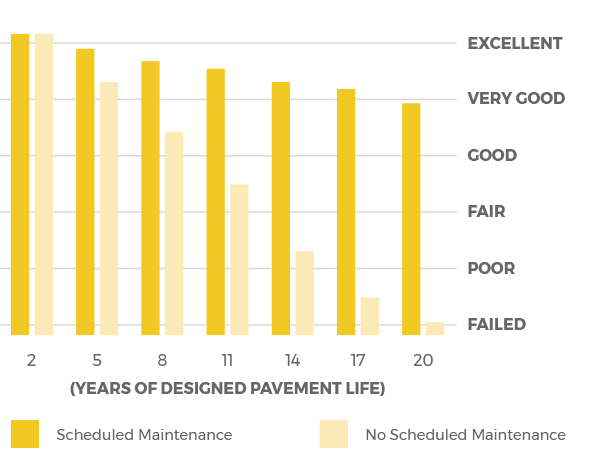 Every year, homeowners, businesses and companies in Northeast Ohio spend tens of thousands of dollars on asphalt driveway and parking lot repairs that could have cost in the hundreds or low-thousands through annual or bi-annual maintenance and upkeep. Furthermore, with curb appeal playing a role as an increasingly important piece of consumer psychology, it’s a safe case to make that a lack of due diligence by business owners comes at the cost of sales, too. 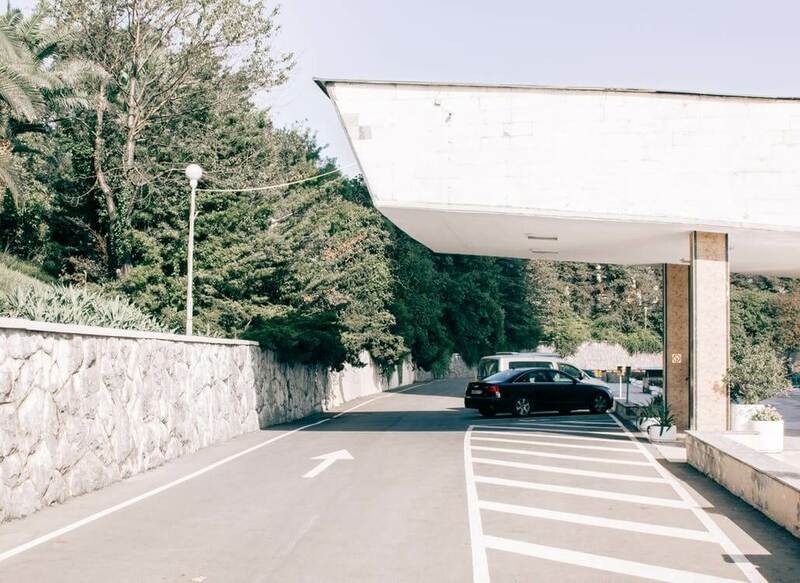 Unless you really have a deep tie with your visitors, can you blame someone for avoiding visiting the establishment with a pothole-riddled parking lot? The average lifespan of an asphalt pavement without maintenance in a seasonal climate is 15 years. Such a lifespan is considered “over” when significant structural and aesthetic problems start to appear. 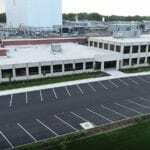 Annual or bi-annual sealcoating, along with a diligent maintenance program from your local asphalt contractors in Cleveland, Ohio, including crack sealing and patching/pothole filling can extend the overall life of your asphalt driveway or parking lot by up to 20 years. There are dozens of circumstances that will contribute to the formation of damage in an asphalt pavement, and it’s usually not the fault of the paving company- asphalt and blacktop simply don’t last forever. Freeze-thaw cycles, subtle earth movement, heavy traffic, and the growth of tree roots are all extremely common conditions that can crack an asphalt pavement. The presence of cracks will increase as the asphalt surface oxidizes, which it will continue to do for 30 years after the asphalt has been originally laid. Oxidation, referring to the breakdown of carbon bonds by oxygen, reduces the innate flexibility of bitumen asphalt and leaves you with a more rigid, brittle, and fragile surface. Once a crack has developed, moisture will enter the compromised area and begin breaking down the interior structure of the pavement. It is extremely difficult to completely remove moisture from a crack, but once you or your local paving expert has cleaned the crack and filled it, the integrity of your parking lot is essentially restored. A crack that goes unchecked will eventually turn into a pothole as the trapped moisture expands during freeze-thaw cycles, displacing the existing asphalt and destroying the foundation. Naturally, the deeper the pothole is, the more expensive it gets. Homeowners should be wary of the damage that may be caused by trees growing too close to their asphalt driveway, and should have a conversation with an estimator about how likely damage will be induced by current state of the landscaping. Arriving to a price for a crack sealing job combines a number of factors, from the amount of crack sealant necessary to the distance of the problem area establishment from our headquarters. Crack sealing jobs generally run between $275 to $3,950. We offer a more detailed breakdown of crack filling costs on our website. A quality asphalt paving job is evenly graded, paved, line-striped and sealcoated as is shown. To get this kind of quality paving for your residential or commercial property, you can request our services by clicking or tapping the image. A pothole, which is essentially the combined effort of multiple cracks to separate some portion of an asphalt pavement, contributes to the same issues as cracks to a higher degree. With the interior structure of the asphalt pavement exposed, oxidation is increased, the damage capabilities of freeze-thaw cycles are increased, and damage to the sub-base is increased, which requires more costly excavation services to repair. Once the correct diagnosis for lasting repair has been identified, the correct hot mix, emulsion mix, stockpile patching mix, or proprietary patch with the appropriate aggregates and modified binders is selected and applied to the area, then compacted to fill the underlying gaps. Potholes in advanced stages of disrepair can be a huge hazard for unsuspecting drivers, causing damages to a vehicle’s undercarriage and liabilities to property owners. Because potholes are a generic term for a wide range of structural problems, nailing down a price range for correcting the issue is a difficult task. Some homeowners and business owners purchase asphalt repair materials at Lowes or Home Depot in an effort to repair their own driveways and parking lots. Products include Quikrete, Road Rescue Asphalt Repair, and Quality Pavement Repair (QPR). These kinds of DIY asphalt repairs are a much different animal than addressing a collapsed sub-grade with improper drainage or advanced sub-base oxidation. Structural damage needs to be addressed by large paving companies capable of full-depth construction, and not your average residential asphalt companies in Cleveland, Ohio, or overlooked after applying a home-made patch. We recommend you always take advantage of our free site evaluation before you purchase asphalt or concrete repair solution from your local hardware store. That said, it is important for our clients to get a price range whenever possible. Patching jobs usually run between $350 – $4,500, and full-depth repair jobs can range from $600 – $7,000+. 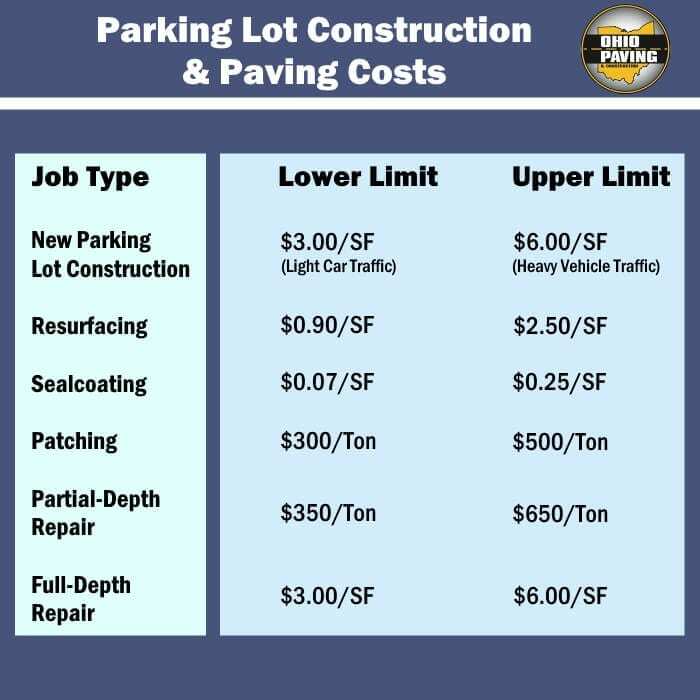 We offer a more detailed breakdown of pothole repair costs and excavation repair efforts on the corresponding service pages. Sealcoating is the most powerful tool in the blacktop or asphalt maintenance arsenal for preventing natural damages. Not to mention the drastic increase in curb appeal from its crisp, black color, sealcoating benefits your property in numerous ways. By sealcoating your asphalt, the rate of oxidation that causes fragility is reduced, the asphalt is protected from the stains caused by oil and gas spills, and sweeping and cleaning become much easier credited to the smooth surface created. The dark black color also helps retain heat during the winter months, forcing snow to melt more quickly and stabilizing the temperature of the asphalt. Most paving companies recommend laying a new sealcoating layer every 24-36 months, and it should only be applied while temperatures remain at 50°F during and for eight hours after application. A quality sealcoat like those offered at Ohio Paving & Construction will have sand or a similar additive to increase solid contact with your car’s tires as well, decreasing slippage and making it easier to traverse a sloped driveway. Sealcoating jobs can involve between one application and three, but the industry standard for your average parking lot is a recommendation for two. This is not simply an upsell- but rather a way to involve both sealcoating methods, the squeegee and spray methods, which provide a full and complete coverage of the asphalt surface layer. Sealcoating jobs often run between $300 – $8,000+, depending on the square footage, man-hours, distance of your job site from the office, and the amount of surface layer cleaning that must be completed. 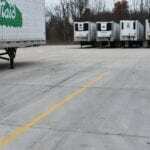 Our services section offers a more detailed breakdown of asphalt parking lot sealcoating. Properly defined boundaries create a harmonious order for pedestrians and drivers to operate in. Bright and vibrant line striping is necessary for those visiting your establishment to follow the rules that maximize the visiting experience for everyone. Ohio Paving offers speedy, efficient line striping services, often applied at night and ready by morning. It takes about 30 minutes to dry and 1 hour before traffic can roll over the lines without causing damage. There’s no specific set of guidelines for when restriping your parking lot should occur. When it begins to fade and parking spaces become unclear, it’s probably the right time to call Ohio Paving & Construction. We list our prices by the parking “stall,” as this is the most common format to quote line striping services, however we know that pavement parking is not limited strictly to stalls and parking spaces. Reach out using the contact form at the bottom of this page to get the most accurate quote for your line striping needs. To request our asphalt maintenance services, contact our office by calling 440-975-8929, or email us at info@ohiopaving.com You can also request services by filling out the contact form below.